Reverse transcription polymerase chain reaction (RT-PCR) is one of many variants of polymerase chain reaction (PCR). This technique is commonly used in molecular biology to detect RNA expression. RT-PCR is often confused with real-time polymerase chain reaction (qPCR) by students and scientists alike. However, they are separate and distinct techniques. While RT-PCR is used to qualitatively detect gene expression through creation of complementary DNA (cDNA) transcripts from RNA, qPCR is used to quantitatively measure the amplification of DNA . In all land plants and algae, chloroplast DNA (cpDNA) has been found to exist as a single circular molecules ranging from 80 to 300 kb. The chloroplast genome is densely packed with genes. Chloroplast gene products identifies function either in photosynthesis or as components of the chloroplast protein synthesizing system.In this procedure, sucrose step gradient procedure is used to isolate chloroplast and cpDNA. The Genomic DNA is Isolated from Whole Blood by using RBCL solution which lysis the RBC and WBC left intact. The white blood cells and their nuclear membrane are lysis by WBCL solution then the proteins and other cellular components are removed by saturation solution. Finally the high molecular weight Genomic DNA is precipitated by using absolute alcohol. The obtained Genomic DNA is resolved by using Agarose gel electrophoresis. The kit contains a membrane embedded in a spin column for binding up to 1-5ug of genomic DNA. Nucleotides, proteins, salts, and other impurities do not bind to the Column. 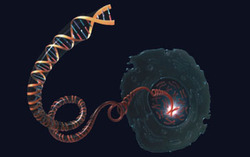 Purified genomic DNA can be applied in most molecular biology experiments including restriction digestion, PCR and other molecular technique. A procedure for extracting plasmid DNA from bacterial cells is described. The method is simple enough to permit the analysis by gel electrophoresis. Many different methods and technologies are available for the isolation of genomic DNA. In general, all methods involve disruption and lysis of the starting material followed by the removal of proteins and other contaminants and finally recovery of the DNA. Removal of proteins is typically achieved by digestion with proteinase K, followed by salting-out, organic extraction, or binding of the DNA to a solid-phase support (either anion-exchange or silica technology). DNA is usually recovered by precipitation using ethanol or isopropanol. Long PCR Amplification of extremely long PCR products (up to 40 kb DNA)Long Range PCR refers to the amplification of DNA lengths that cannot typically be amplified using routine PCR methods or reagents. For simple DNA templates, polymerases optimized for Long Range PCR can amplify up to 30 kb and beyond. Nested PCR used to increase the specificity of DNA amplification. Two sets of primers are used in two successive reactions. In the first PCR, one pair of primers is used to generate DNA products, which may contain products amplified from non-target areas. The products from the first PCR are then used as template in a second PCR, using one ('hemi-nesting') or two different primers whose binding sites are located (nested) within the first set, thus increasing specificity. Nested PCR is often more successful in specifically amplifying long DNA products than conventional PCR, but it requires more detailed knowledge of the Sequence of the target. Mitochondrial DNA Isolation Teaching Kit. Mitochondrial DNA is only a small portion of the DNA in a eukaryotic cell; most of the DNA can be found in the cell nucleus, and in plants, the chloroplast as well. 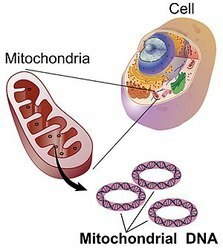 In humans, mitochondrial DNA can be assessed as the smallest chromosome coding for 37 genes and containing approximately 16,600 base pairs.Mitochondrial DNA (mtDNA or mDNA) is the DNA located in mitochondria; cellular organelles within eukaryotic cells that convert chemical energy from food into a form that cells can use, triphosphate (ATP). Restriction enzymes are Nucleases which can cleave the sugar-phosphate backbone of DNA, found in bacteria. As they cut within the molecule, they are commonly called restriction endonucleases. They specifically cleave the nucleic acids at specific nucleotide sequence called Restriction sites to generate a set of smaller fragments. In molecular biology, transformation is the genetic alteration of a cell resulting from the direct uptake and incorporation of exogenous genetic material from its surroundings and taken up through the cell membrane. 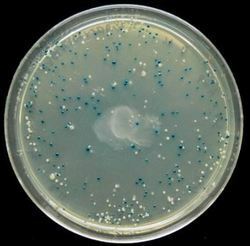 Transformation occurs naturally in some species of bacteria, but it can also be affected by artificial means in other cells. For transformation to happen, bacteria must be in a state of competence, which might occuras a time-limited response to environmental conditions such as starvation and cell density. "Transformation" may also be used to describe the insertion of new genetic material into nonbacterial cells, including animal and plant cells; however, because "transformation" has a special meaning in relation to animal cells, indicating progression to a cancerous state, the term should be avoided for animal cells when describing introduction of exogenous genetic material. Nucleosome Mapping by Micrococcal Nulease (MNase). The basic repeating unit of chromatin, the nucleosome, is known to play a critical role in regulating the process of gene transcription. The positioning of nucleosomes on a promoter is a significant determinant in its responsiveness to gene-inducing signals. For example, positioning and subsequent mobilization of nucleosomes can regulate the access of various DNA factors to underlying DNA templates. Several mechanisms have been proposed to direct the process of nucleosome displacement such as chemical histone modifications, ATP-dependent remodelling, and the incorporation of histone variants. Thus, rather than being an inert molecular structure, chromatin is highly dynamic in response to the transcription process. In this section, we describe two methodologies that allow the determination of exact nucleosome positioning within specific gene regions. Transduction is the process by which DNA is transferred from one bacterium to another by a virus. It also refers to the process whereby foreign DNA is introduced into another cell via a viral vector. Transduction does not require physical contact between the cell donating the DNA and the cell receiving the DNA (which occurs in conjugation), and it is DNase resistant (transformation is susceptible to DNase). Transduction is a common tool used by molecular biologists to stably introduce a foreign gene into a host cell's genome. In molecular biology, gel extraction or gel isolation is a technique used to isolate a desired fragment of intact DNA from an agarose gel following agarose gel electrophoresis. After extraction, fragments of interest can be mixed, precipitated, and enzymatically ligated together in several simple steps. This process, usually performed on plasmids.After DNA samples are run on an agarose gel, extraction involves four basic steps identifying the fragments of interest, isolating the corresponding bands, isolating the DNA from those bands, and removing the accompanying salts and stain. Estimation of DNA is based on the Ethidium Bromide Fluorecent Staining of DNA. Ethidium Bromide is a Fluorescent dye, Which intercalates between the stacked bases. The uorescent yield of the dye - DNA complax is much graeter than the unbound dye. UV irradiation at 254nm is absorbed by the DNA and transmitted to the dye and the bounded dye itself absorbs radiation at 302nm and 366nm. Mutation Detection and Analysis (Mutagenesis) Teaching kit. Mutation occur due to deletion, insertion or duplication of bases. Mutation Can be detected by restiction enzyme mapping. Insertion, deletion or duplication of a base may create a new restiction enzyme site. After harvesting and resuspension, the bacterial cells are lysed in NaOH-SDS in the presence of RNase A. SDS solubilizes the phospholipid and protein components of the cell membrane, leading to lysis and release of the cell contents. NaOH denatures the chromosomal and plasmid DNAs, as well as proteins. The optimized lysis time allows maximum release of plasmid DNA from the cell without release of cell wall-bound chromosomal DNA, while minimizing the exposure of the plasmid to denaturing conditions. Long exposure to alkaline conditions may cause the plasmid to become irreversibly denatured. 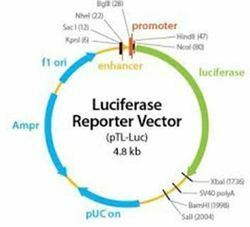 This denatured form of the plasmid runs faster on agarose gels and is resistant to restriction enzyme digestion. The lysate is neutralized by the addition of acidic potassium acetate. The high salt concentration causes KDS* to precipitate, and the denatured proteins, chromosomal DNA, and cellular debris become trapped in salt-detergent complexes. Bacterial Gene expression is the process by which information from a gene is used to the synthesis a functional gene product. Genomic DNA Extraction From Yeast Teaching Kit. The Yeast Genomic DNA is isolated by Chloroform method. The cell wall is lysed by using lysis solution together with glass beads. It is followed by treatment with Phenol-Chloroform. Finally the DNA is precipitated by using ethanol. The obtained genomic DNA is resolved by using horizontal agarose gel electrophoresis. Physical and Chemical Mutagens on E.coli teaching kit Pro Tech Ex-Study of Physical and Chemical Mutagens on The Su UV Light. UV light which has a lower energy content than ionizing radiations, are capable of producing lethal effects in cells exposed to low penetrating wavelengths in range of 210 to 300nm. Cellular components capable of absorbiong UV light are nucleic acids with the DNA as the primary site of damage. this results in the inabilityy to form viable cells after exposure to UV radiation. Hydroxylamine is used to mutagenize DNA in Vitro, when used in vitro, Hydroxylamine reacts with cytosine, converting it to a modified base that pairs with adenine. This has two consequences that is Hydroxylamine only produces GC to AT transitions, and mutations induced by hydroxylamine cannot be reverted with hydroxylamine. DNA Extraction From Animal Tissue Teaching kit. A simple technique for the isolation of very high molecular weight genomic DNA from animal tissues and cells is described. The method involves rapid isolation of nuclei and their embedding in agarose beads followed by extraction of lipids and proteins with SDS. The protocol does not require proteolytic digestion and the whole procedure can be completed in 1 day. The isolated DNA is digestible by restriction enzymes and free of ligase inhibitors. Southern blotting was named after Edward M. Southern who developed this procedure at Edinburgh University in the 1975. It allows investigators to determine the molecular weight of a restriction fragment, to measure relative amounts in different samples and to locate a particular sequence of DNA within a complex mixture. DNA (genomic or other source) is digested with a restriction enzyme and separated by gel electrophoresis and transferred from an agarose gel onto a membrane. DNA methylation is a biochemical process where a methyl group is added to the cytosine or adenine DNA nucleotides. DNA Molecular Weight Determination Teaching Kit. Agarose gel electrophoresis method is used to measure the molecular size of DNA and RNA molecules. For separation of very large DNA molecules. The migration rates of DNA molecule depend upon their respective molecular weight. This simple and fast method is frequently used to determine the size of a linear DNA fragment by comparing its mobility to a DNA fragment marker of known size. The size of pUC19 will be increased to 5755bp with the addition of lacZ gene, which encodes β-galactosidase. The lacZ gene was amplified by PCR method. The amplified sequence was transformed to E.coli host .The production of β-galactosidase enzyme was analysed by SDS - PAGE method. Hybridization involves several steps. First, the probe and sample DNA are allowed to hybridize under the appropriate conditions. The correct temperature, incubation times, and buffer conditions must be used. Next, the sample DNA is washed using conditions that will remove unhybridized probe but not the hybridized probe. Finally, the sample DNA is tested for the presence of the hybridized probe. The probe is labeled with a radioactive molecular tag (or some other tag) that allows it to be detected following hybridization. Genetic disorders and other related diseases are often associated with Single Nucleotide Polymorphism (SNP) occurring at precise positions on genes/ genomes. Development of SNP-specific primers that amplify a specific fragment in PCR when a specific SNP is present helps in disease detection.SNP detection where two DNA templates, one wild-type and the other template with SNP are used for PCR amplification individually along with 2 pairs (4 numbers) of primers, one pair specific to wild-type and the other, specific to SNP-type primer. Multiplex PCR uses several pairs of primers annealing to different target sequences. This permits the simultaneous analysis of multiple targets in a single sample. For example, in testing for genetic mutations, six or more amplifications might be combined. In the standard protocol for DNA Fingerprinting, the targets assayed are often amplified in groups of 3 or 4. Multiplex Ligation-dependent Probe Amplification (or MLPA) permits multiple targets to be amplified using only a single pair of primers, avoiding the resolution limitations of multiplex PCR. Multiplex PCR has also been used for analysis of microsatellites and SNPs. The polymerase chain reaction (PCR) has found widespread application in many areas of genetic analysis. For most, if not all of these applications, alternative methods of DNA (or RNA) amplification, can be substituted.The first application of PCR was for genetic testing, where a sample of DNA is analyzed for the presence of genetic disease mutations. Prospective parents can be tested for being genetic carriers, or their children might be tested for actually being affected by a disease. DNA samples for testing can be obtained by amniocentesis, chorionic villus sampling, or even by the analysis of rare fetal cells circulating in the mother's bloodstream. PCR analysis is also essential to preimplantation genetic diagnosis, where individual cells of a developing embryo are tested for mutations. In this method the colonies grown on glucose medium are overlay with 2, 3, 5 Triphenyl Tetrazolium chloride (TTC). After incubation the petite colonies remains white whereas the wild type colonies turned to red because of the reduction of tetrazolium chloride resulting formazan compound. PCR is a revolutionary method developed by Kary Mullis in the 1980s. PCR is based on using the ability of DNA polymerase to synthesize new strand of DNA complementary to the offered template strand. Because DNA polymerase can add a nucleotide only onto a preexisting 3'-OH group, it needs a primer to which it can add the first nucleotide. This requirement makes it possible to delineate a specific region of template sequence that the researcher wants to amplify. At the end of the PCR reaction, the specific sequence will be accumulated in billions of copies (amplicons). An improved procedure has been developed for the fusion of plant protoplasts based on the use of polyethylene glycol possessing a low carbonyl content. Different commercial preparations of PEG were analysed using a sensitive carbonyl assay procedure and only those with a very low carbonyl content (< 5 × 10−4M) were used. Sterilisation by membrane filtration was employed, since autoclaving markedly increased the carbonyl content with associated deleterious effects on fusion frequency and heterokaryon viability. Elution of PEG was carried out using a hypotonic mannitol solution at pH 5.8, without added Ca2+, immediately followed by 9 % w/v mannitol (pH 5.8), again without added Ca2+. This improved PEG fusion procedure has been found to be applicable to a range of protoplast combinations. Its use results in a high fusion frequency with good resultant heterokaryon viability and a low level of clumping. Lambda Phage DNA Isolation Teaching Kit. Viruses that infect procaryotes are known as bacteriophages,or phages, because when they were first discovered,they appeared to eat bacterial cells, generating a clearing, or plaque, on a lawn of susceptible bacteria. In reality, the bacteria are killed by lysis as newly produced phages are released from the damaged cells. Joining linear DNA fragments together with covalent bonds is called ligation. More specifically, DNA ligation involves creating a phosphodiester bond between the 3' hydroxyl of one nucleotide and the 5' phosphate of another.The enzyme used to ligate DNA fragments is T4 DNA ligase, which originates from the T4 bacteriophage. This enzyme will ligate DNA fragments having overhanging,cohesive ends that are annealed together. Restriction enzymes (Hind III) are Nucleases which can cleave the sugar-phosphate backbone of pBR 322 & pUC 18, found in bacteria. As they cut within the molecule, they are commonly called restriction endonucleases. They specifically cleave the nucleic acids at specific nucleotide sequence called Restriction sites to generate a set of smaller fragments. Looking for BIOTECH KITS ?